Property: You gain a +3 bonus to attack rolls and damage rolls you make with this staff. Property : You must be a cleric, a druid, or a mage to become attuned to this item. The staff has 10 charges. 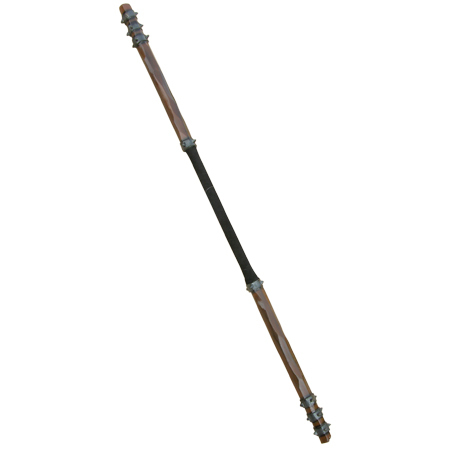 When you hit with an attack using this staff, you can expend up to 3 charges. For each charge expended, the target of your attack takes 1d6 extra force damage. If you expend the staff’s last charge, roll a d20. On a 1, the staff blackens and loses this property. The staff cannot regain charges and functions as a normal quarterstaff. The staff regains 1d6 + 4 expended charges each day at dawn. This sturdy staff is made of oak and lacks adornment, except for a single glyph carved near the head. When held firmly, a staff of striking causes the wielder’s hands to tingle slightly. These staffs are thought to have originated among a sect of mendicant clerics who used them for self-­‐defense.